Supports more than 16 fieldbus protocols including Ethernet, Profibus, CANopen, etc. Granular I/O modules in 1, 2, 4, 8, or 16 channels…buy only the I/O you need. Combine a variety of voltages and signal types in a single node for flexible node configuration. Pluggable connector option with 753 series I/O modules reduces wiring time and errors. Open IEC 61131 PLC programming software offered as a site license. 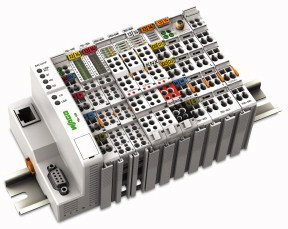 Combining these features with CAGE CLAMP® spring pressure connection technology, WAGO internal quality standards, and world wide approvals, results in a proven and reliable I/O platform suitable for a variety of applications in industrial automation, process automation, building automation, ship building, and more.